My holiday wrapping continues! 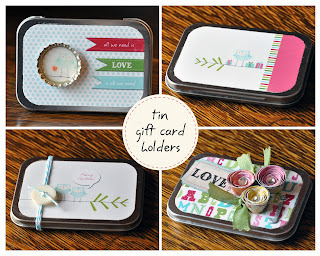 This time I wanted to share with you my little tin gift card holders. 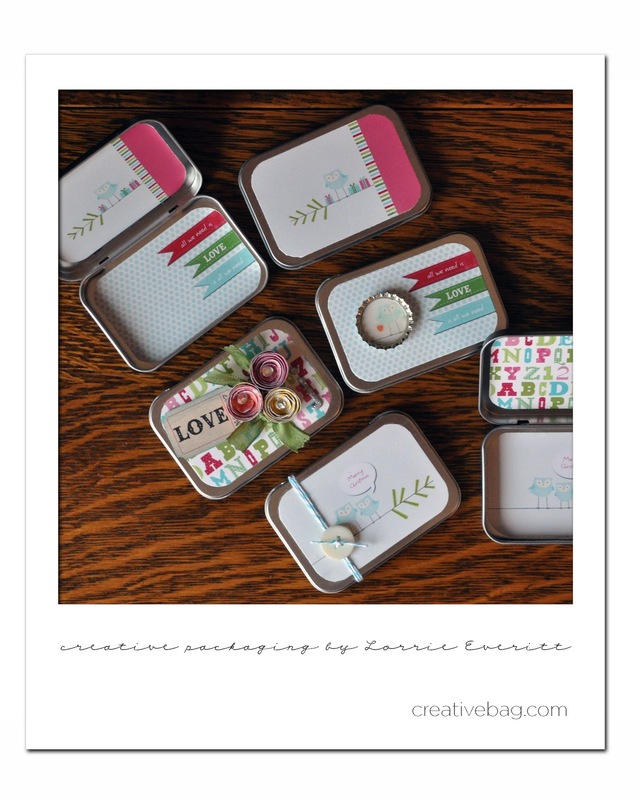 Again, I purchased these plain metal containers at Creative Bag and I used the digital scrapbooking kit I purchased here to create the art to decorate them. I printed my designs as 4x6 photos at Costco but you could do this on your inkjet or laser printer. 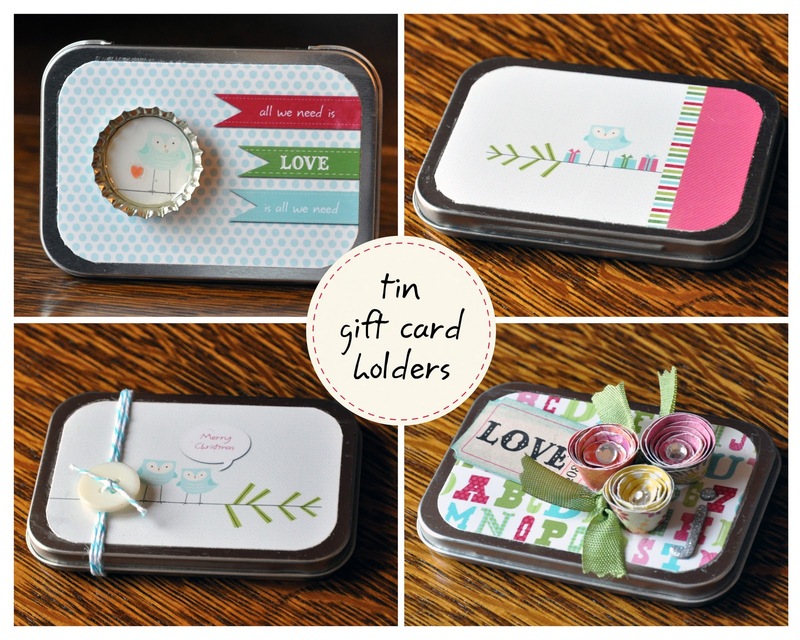 I've used patterned scrapbook papers to decorate these gift card holders as well. All you have to do is cut your paper into 3 3/8" x 2 1/4" rectangles and round the corners with a corner cropper. This same size will work for the outside and inside of the tin ... it's important to round the corners of the paper to fit the shape of the container. I prefer to use a gel medium to adhere the papers to the tin. Golden (medium matte) gel medium works great and there are lots of other brands of gel medium available at most arts & craft stores. Modge podge will also work or if you don't like to use "glue" you can use two sided tape. I decorated my tins with paper flowers, decorated bottle caps and of course, divine twine & buttons to match my other holiday wrapping projects. 8. you can also loosen the paper if it is too tight. Super easy right?! Let the paper dry before you use it as an embellishment in your projects. 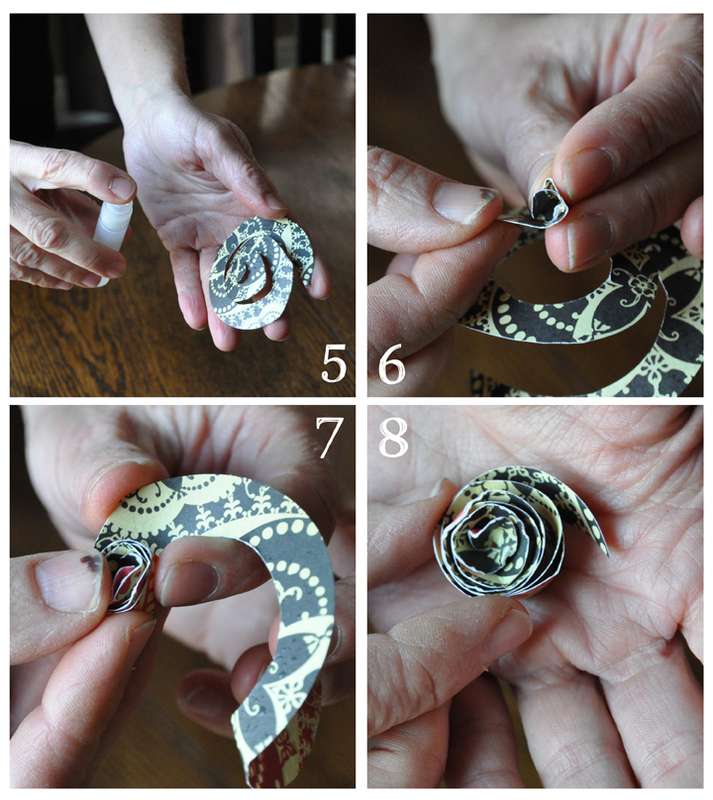 While it is drying ... go grab your paper punch and make some more! These are easy to make while the kids at swimming/skating/dance lessons. Want to know how I attached the paper flowers to my tin gift card holders? 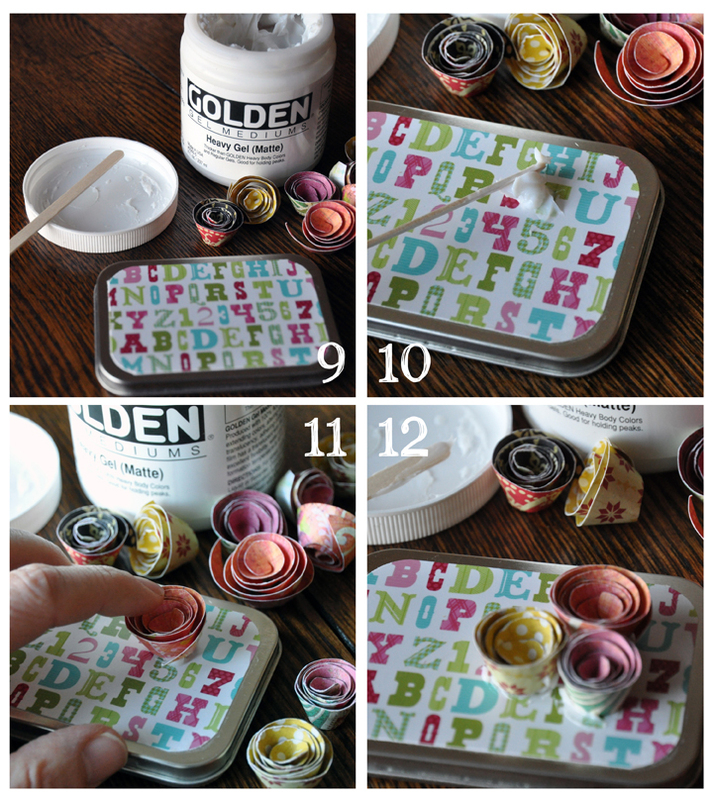 My secret is to use a big blob of Golden gel medium ... but this time I use the heavy gel (matte). You can most likely get away with using the medium weight too but I like to make sure that my projects look good and stay together long after I have given them away. 11. place your flower on top of the gel medium and press it down into shape ... you can relax the paper and let it open a bit if you want at this point. The gel medium will dry clear so don't worry if you see a little bit of it at the base of the flowers. 12. I think that a grouping of 3 or more of these flowers is sweet. 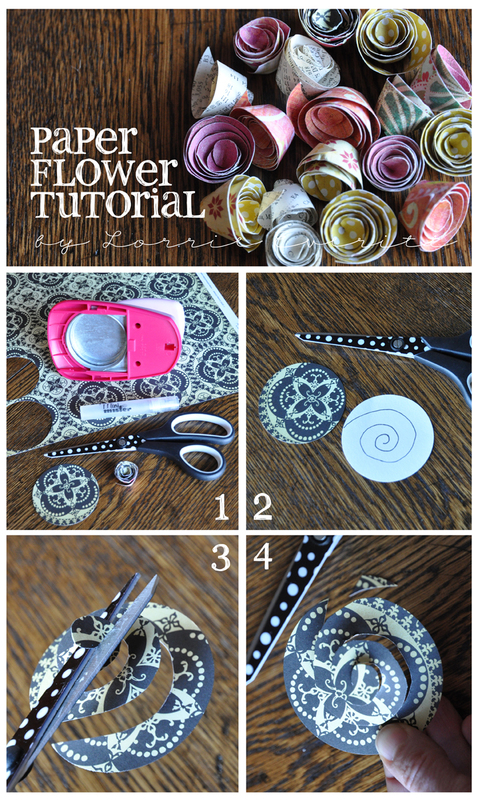 You can add rhinestones, small buttons or glitter to the centres of the flowers if you want. I often add small scraps of green ribbon or paper for leaves. 1. gather your supplies: paper (photo, scrapbooking paper, etc), 1" circle punch, bottle caps (recycle ones you have or use new ones without liners) and diamond glaze (I used Glossy Accents - available at most craft and scrapbooking stores). 2. first you have to cut a 1" circle from whatever paper you are using for the design in your bottle cap. I flip the punch over so I can see exactly what I am punching out. 4. press the paper down and leave it to dry for an hour ... you want the paper to be completely bonded to the bottle cap because if not, the paper will move during the next step and will not lay flat. 5. & 6. once you know that the paper will not move we will apply a thin coat of diamond glaze to the top of the design to seal it and give it a glossy finish. Tip: DO NOT SHAKE your bottle of diamond glaze ... it will give you bubbles and you do not want bubbles. If the bottle is plugged, use a pin to poke the top and allow the glaze to run freely. Start by adding a generous blob of diamond glaze in the middle and then gently move it around to cover the entire surface. It will dry clear. Allow your diamond glaze to dry for a few hours ... if you touch it too soon you will leave a finger mark. Once it is completely dry you can add a magnet to the back if you wish. I use E-6000 glue to attach the bottle caps to magnets, wood & metal. Warning: if you are using these bottle caps as embellishments on gift card holders, do not add a magnet to the bottle cap. 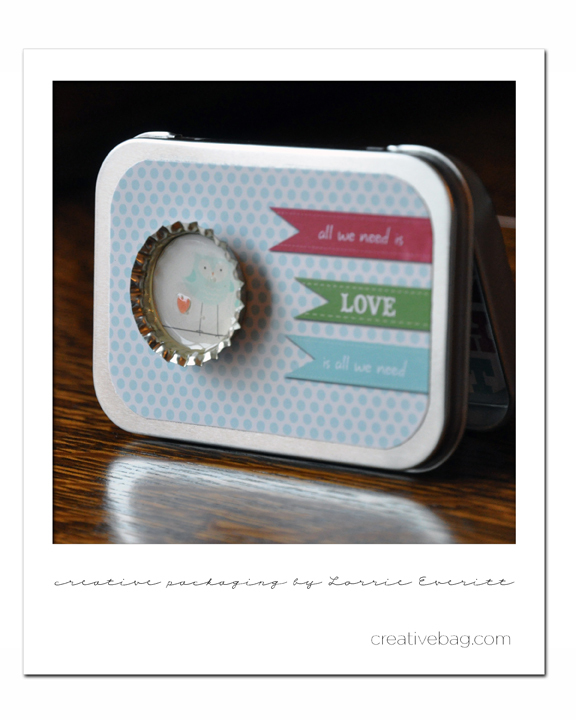 Sounds like a cute idea but the magnet will deactivate any electronic gift cards that you put inside and you don't want that to happen. I glued my bottle caps to the tin containers. This stuff is really really good. 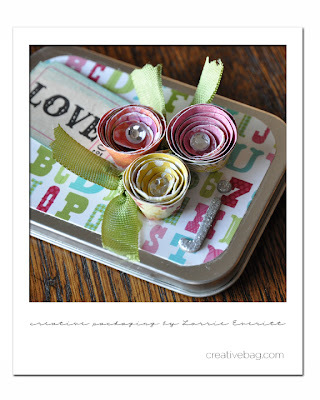 Beautiful, creative and fun to make. 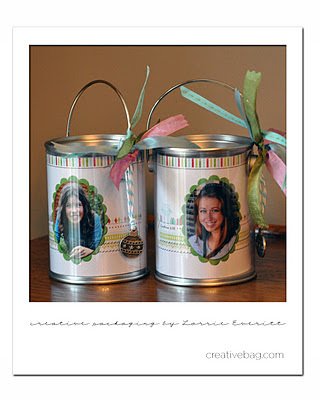 Kids will love to spend their Christmas holidays doing such creative stuffs. My kids will love making these. Will show them this blog. Nice ideas!! How you explain everything.... you´re amazing! Please help me with something, what happen If I do not use bottle caps? What I can use as a "base"?, I was wondering if I use paper, the diamond glaze will be glued at it. Also, silicone is the same as diamond glaze?